Here we will list news items relevant to the UK Arctic and Antarctic Polar Research Community. The report can be found online here and an associated blog can be found here. We’re really excited and pleased to say that the NERC Arctic Station in Ny-Ålesund, Svalbard, will be hosting BBC Radio 4’s Today Programme next week, including science editor Tom Feilden and presenter Martha Kearney. SAVE THE DATE: British Branch International Glaciological Society meeting will be held on 4-5 September 2019 at Northumbria University, Newcastle upon Tyne, UK. The British Branch (https://www.igsoc.org/about/britishbranch/) meeting is traditionally a welcoming, engaging and lively venue to present on any aspect of glaciological research. Further deatils will be released later in the year. The NERC Arctic Office and the British Antarctic Survey will be jointly hosting an Arctic Station Open Day on Thursday 21 February at the Aurora Innovation Centre, British Antarctic Survey, from 1030 to 1500. If you would like to know more about the UK’s only Arctic research facility in Ny-Alesund, Svalbard, meet researchers who have worked there, discuss your research ideas with the Station Manager, Nick Cox and much much more, then this is an invaluable opportunity. If you would like to attend, please visit https://www.arctic.ac.uk/uk-arctic-research-station/arctic-station-open-day/ for further information, including registration details. The NERC Arctic Office is seeking nominations for two United Kingdom representatives to the International Arctic Science Committee’s (IASC) Social and Human Working Group. The deadline for receipt of nominations is Friday 11 January 2019. This is an excellent opportunity for researchers with strong social and human science interests based in the United Kingdom to engage with colleagues from over 20 other countries to: shape the priorities and activities of the Working Group; raise the profile of the Working Group within the UK community; and develop cross-cutting activities. Details on the role, eligibility criteria and nominations process are available from the NERC Arctic Office website. Self-nominations are welcome. The call for applications for the UK-Canada Arctic Partnership: Bursaries Programme 2019 is now open. The Programme provides Bursaries of up to £20,000 for UK-based researchers to join Canadian-led projects in the Canadian Arctic and High North in the 2019 field season. The Programme is funded by the Department for Business, Energy and Industrial Strategy (BEIS) and delivered in collaboration with the British High Commission in Ottawa and the NERC Arctic Office. The first two years of the Bursaries Programme have seen 30 research teams from the UK join Canadian-led projects across a broad range of terrestrial, marine, atmosphere, cryosphere and social research themes. The EU H2020 funded INTERACT (International Network for Terrestrial Research and Monitoring in the Arctic) opens a call for research groups to apply for Transnational Access to 43 research stations across the Arctic and northern alpine and forest areas in Europe, Russia and North-America. The sites represent a variety of glacier, mountain, tundra, boreal forest, peatland and freshwater ecosystems, providing opportunities for researchers from natural sciences to human dimension. Transnational Access includes free access (either physical or remote) for user groups/users to research facilities and field sites, including support for travel and logistic costs. The call for Transnational and Remote Access applications is open on 13th August – 12th October, 2018, for projects taking place between March 2019 and April 2020. You can find the TA/RA Call information, stations available in the call, descriptions of stations and their facilities, and registration to the INTERACCESS on-line application system on the INTERACT website. Durham University will be hosting this year’s UK Antarctic Science Conference on 10th-12th September 2018 (the conference will run from Monday lunchtime to Wednesday lunchtime). The conference will include oral and poster presentations, and abstracts are invited on any aspect of Antarctic Research. The next UK Arctic Science conference will be hosted by Loughborough University, and take place on the 11th to 13th September. Further details, including a webpage with all relevant information will be made available soon. INTERACT Transnational Access Call for 2018/2019 is now open! The call for applications is open on 1st September-13th October 2017 for Transnational Access and Remote Access taking place between March 2018 and April 2019. Further TA call information, stations available in the call, descriptions of stations and their facilities, and registration to the INTERACCESS on-line application system can be found from the INTERACT website. Submissions are invited for the international conference being held in Aberdeen from 27-29 August 2017. Conference panel papers of up to 200 words will address five themes. The Anthropocene in the Arctic? The Call for Abstracts (for both oral and poster presentations) is available here on the Conference website along with a full description of the proposed Conference panel papers. This international Conference – Conversations from the North: Scholars of many disciplines and inhabitants of many places in dialogue with one another, with animals and plants, and with the land is being held in association with the 11th Rectors’ Forum of the University of the Arctic. The NERC Arctic Office is seeking nominations for United Kingdom representatives on the International Arctic Science Committee’s Atmosphere, Terrestrial, Social and Human, Cryosphere and Marine Working Groups. Self-nominations are welcome. The deadline for nomination is 21 February 2017. Applications should be sent to arctic@bas.ac.uk. Further details about the call can be downloaded here. For further information about the Changing Arctic Ocean Programme, and details of the funded projects, please see the NERC website. NERC will be commissioning its data centres and associated services in 2017. As part of this process, NERC conducted an evaluation of the current performance of the data centres in July 2016. NERC would now like to understand what future services are required from its data centres. NERC is therefore inviting users and potential users of its environmental data centres to take part in a survey to help us better understand their requirements for future services. Results from the survey will form part of the evidence assessed by an independent expert review panel. The panel will provide recommendations to NERC to inform the commissioning of our ongoing data services in 2017. The survey is open to all users of the NERC environmental data centres and will be open until 16:00 on 6 December 2016. To complete the Survey please follow the link to the NERC environmental data centres survey. The new INTERACT Transnational Access (TA) call is now open! This is for TA visits taking place between March 2017 and April 2018. This second phase of INTERACT has recently been funded through the EU Horizon 2020 programme. This call is for TA to all 43 research stations offering Transnational Access in INTERACT, including both physical and remote access.The stations offering TA are located across the Arctic and northern alpine and forest areas in Europe, Russia and North-America. The sites represent a variety of glacier, mountain, tundra, boreal forest, peatland and freshwater ecosystems, providing opportunities for researchers from natural sciences to human dimension. Further TA call information, stations available in the call, descriptions of stations and their facilities, and registration to the INTERACCESS on-line application system can be found on the INTERACT website – www.eu-interact.org. Deadline: The call will close on Sunday 18th December 2016. For additional information, please contact the Transnational Access coordinator Hannele Savela, hannele.savela(at)oulu.fi. There was fantastic support from UK-based researchers to turn the idea of a short film about the UK and Arctic science into reality. This visually compelling four minute film which shows how the range of innovative ideas, assets and international partnerships creates a dynamic and ambitious community here in the UK. The film will get its official preview at The Royal Society event on 18 October ‘Understanding the Arctic: science, technology and international collaboration’ and will then be available for everyone. We hope you can link to it and use it when you’re connecting with others in developing partnerships on your own research and from your institutions. The film can definitely be seen as the visual companion to the ‘United Kingdom and Arctic Science’ document mentioned above. It’s available via www.arctic.ac.uk and through YouTube: search ‘The Arctic: A Dynamic Environment’. The UK Arctic and Antarctic Partnership (UKAAP) have today launched a new short document ‘The United Kingdom and Arctic Science’. “We have a very strong story to tell on the United Kingdom’s involvement at the leading edge of Arctic science. We have some of the best scientists, universities and research centres in the world; a diverse range of assets and infrastructure; and the appetite and skills to form excellent international partnerships. The commitment from the whole of the UK community to high-quality, independent research, with strong impact, is clear. In the UK Arctic and Antarctic Partnership (UKAAP), we have the privilege and responsibility to be a strong and committed voice for the polar research community. There is much to champion, but also more that, as a community, we can contribute to help tackle the most pressing Arctic questions. I saw that potential at first hand last week, when accompanying the Science Minister Jo Johnson MP to the White House Arctic Science Ministerial meeting in Washington DC. We all know that the scale of the challenge in understanding and responding to the pace of change in the Arctic requires a truly globalised effort. So for all of these reasons I am very pleased to launch this document ‘The United Kingdom and Arctic Science’ which offers our vision for the Arctic research community, the reasons why we must continue to engage and the principles we think will help to build on our collective success. We do not offer it as a prescriptive manifesto, but as a way of promoting and demonstrating many of the shared values and joint aspirations of what we all know is such a vibrant and powerful network. Prof. Julian Dowdeswell, Chair UKAAP, Director, Scott Polar Research Institute, University of Cambridge. The United Kingdom research community will have a strong voice at the Arctic Circle Assembly this year. UK-based representatives will be hosting or speaking in over 15 separate sessions, there will be a special ‘United Kingdom and Arctic Science’ exhibition stand and dedicated sessions on autonomous vehicles and on working inclusively with Arctic communities. Representatives from NOC, SAMS, University of Southampton, Royal Holloway, BAS, University of Hull, University of Lancaster, SPRI, University College London, the UK Science and Innovation Network, University of Exeter, Heriot-Watt University, University of Portsmouth and NERC Arctic Office, amongst others, will be taking part in the Assembly. A list of sessions with UK involvement can be found here, with the full programme available on the Arctic Circle website here . NERC is introducing new ways of identifying and prioritising its services and facilities portfolio over the next five to ten years. NERC is therefore inviting the research community to provide evidence of future needs, including from their current portfolio, which includes the UK Arctic Research Station. This consultation provides the research community with a really important opportunity to have a say on the future of the UK Arctic Research Station in Ny-Alesund. The consultation is open to Principal Investigators eligible to apply for grants and will close at 16:00 on 30 September 2016. To participate, please go to http://www.nerc.ac.uk/about/whatwedo/engage/engagement/services/ for further details. The survey itself can be accessed at : https://www.surveymonkey.co.uk/r/9Q2JLD5. There are still spaces available to attend this no registration fee one-day event. To apply for a place, please contact the Arctic Office at arctic@bas.ac.uk. Please note, attendance will not be possible without confirmation from the Arctic Office of a place. Deadline for registering is Thursday 6th October. The 11th Arctic Frontiers conference will be arranged in Tromsø, Norway from Sunday 22 January to Friday 27 January 2017. The title for the 2017 conference is White space – Blue future. Call for papers closes on 20th September 2016. See the Arctic Frontiers website for further information. The Natural Environment Research Council (NERC) is currently evaluating its data centres and seeks the views from the user community through an online questionnaire. The questionnaire should only take a few minutes and can be found here: https://www.surveymonkey.co.uk/r/3SBVWT9 – deadline is 10th June 2016. A list of the data centres can be found below. Your views are an important part of an evaluation of the quality of the service provided by the data centres, which is being done in preparation for the commissioning of NERC’s ongoing data services. The evaluation will be conducted by an independent expert panel chaired by a member of NERC’s Science Board. For further information, please contact Emily Flowers (emiflo@nerc.ac.uk) if you have any queries. The United States will be hosting an Arctic Science Ministers meeting on 28 September in Washington DC. Given the UK’s strong track record in Arctic research we hope that the UK will be invited to attend. The Arctic Office has submitted an initial response to the call for evidence, in consultation with others. This is very much a first cut and there are opportunities to refine and add to the – please let the Arctic Office know what you think. You can also submit evidence and suggestions directly via www.arctic.gov/aesc/ministerial.html . Further updates will be posted as this develops. Participants will receive an email with the log-in link for the session once they have registered. We look forward to hearing from you on the webinar! The 2016 UK Antarctic Science Conference will take place at the University of East Anglia, Norwich, UK 5th to 7th July 2016. This will also include a UK Polar Network (part of APECS – the Association of Polar Early Career Scientists) event (4th–5th July) and a workshop on Biases in Climate Models (7th July). Online booking is now available. Earlybird registration (£60) is available until Friday 20th May. This includes the UKPN event (for early career scientists), refreshments and a conference BBQ. Final registration deadline is 17th June (£100). Abstracts can be submitted until Friday 15th April. Accommodation on campus may be booked on the website at £40 per night B&B. The official outcomes of the Third International Conference on Arctic Research Planning (ICARP III) have been published online. The report, entitled “Integrating Arctic Research – A Roadmap for the Future” presents the key messages that emerged from the 2 year ICARP III process. For more information please see the enclosed report and visit the ICARP III website: http://icarp.iasc.info/. World-famous shipyard Cammell Laird in Birkenhead saw off international competition to build the state-of-the-art vessel, which will help maintain the UK’s position at the forefront of climate and ocean research. Bosses met to sign the contract late on Friday 19 November and detailed design will get underway immediately. Cammell Laird is expected to cut steel in June 2016 and deliver the next-generation polar research vessel ready for operation by NERC’s British Antarctic Survey (BAS) in 2019.
to discuss opportunities for national and international collaboration. This five year programme aims to understand how change in the physical environment (ice and ocean) will affect the large-scale ecosystem structure and biogeochemical functioning of the Arctic Ocean, the potential major impacts and provide projections for future ecosystem services. Please see the Announcement of Opportunity below for full details. New guidance is available to explain what we are looking for, and how to submit ideas. The Strategic Programme Advisory Group (SPAG) will use these ideas to develop proposals for new highlight topics. You are invited to a workshop on 9th-10th November 2015, to discuss the UK’s contribution to the Year of Polar Prediction (YOPP; http://www.polarprediction.net/yopp.html). The aim of the workshop is to review the current status of environmental prediction in the polar regions, and beyond, on timescales from hours to seasons and discuss how the UK can contribute to a major international effort to improve prediction. The focus of the workshop will be on physical processes in the polar regions that are poorly understood, observed or parameterized and how these limitations impact predictability. We will discuss the challenges involved in developing improved environmental prediction services, from short-term weather forecasts to seasonal sea-ice predictions. A number of invited speakers have been arranged and there will also be time for general discussions. The workshop is scheduled to run from 1 pm Monday 9th November to 1 pm Tuesday 10th November in two Exeter venues. Day one will provide an overview and background to the YOPP, while day two will focus on discussing specific scientific challenges and how the UK can contribute. The workshop is open to all and free to attend, but no travel funding will be available. An informal dinner will be arranged for the Monday evening. Please notify your interest in attending by email to Chawn Harlow (chawn.harlow@metoffice.gov.uk) by 19th October 2015. As places are limited invitees will be decided by a very short application (a one paragraph track record, indicating your interests in improving polar predictability and referencing relevant publications). Please include this paragraph with your email application and please also indicate if you plan to attend both days or just one. The workshop is being organised by Chawn Harlow and Ed Blockley (Met Office) and Ian Renfrew (UEA and YOPP Scientific Steering Group). It is anticipated that an Announcement of Opportunity for outline grant proposals will be published on this site in late October and a workshop will be held on 5th November 2015. Proposals are invited for the 2016-17 Advanced Training: Short Courses (ATSC) training scheme. Training funded as part of this scheme must be completed by 31 March 2017. This call invites proposals offering training in a variety of forms that fall both within the NERC science remit as well as addressing one or more of the Priority Training Areas contained within the ATSC Announcement of Opportunity document. Training must prioritise NERC-funded PhD students or develop the skills of environmental sciences early career researchers (working within academic and/or non-academic settings) for future careers in research and other contexts. NERC has a total budget of £1m for this scheme. The maximum applicants can apply for to run a training course is £100k although it is expected that most applicants will request £20k-£50k. Deadline for submission of proposals is 16:00 on 12th November 2015. The InBev-Baillet Latour Antarctica Fellowship provides young scientists with the opportunity to conduct research in East Antarctica operating out of the Princess Elizabeth Antarctica research station. A joint initiative of the InBev-Baillet Latour Fund and the International Polar Foundation, the €150,000 research grant aims to promote scientific excellence in Antarctica and underscores the crucial role polar science plays in furthering our understanding of the Earth and how it functions. The Fellowship is open to researchers studying for a PhD or within 10 years of completing their PhD from any country around the world. Applicants should submit an original research proposal for a project which will include field campaigns operating from the Princess Elisabeth Antarctica station (located in Dronning Maud Land in East Antarctica at 71.57°S 23.20°E). Please note that in 2008 and 2010, the Fellowship was only open to researchers registered at a Belgian University or research institute or other research facility in Belgium. Since 2012 the Fellowship has been opened to researchers based anywhere in the world. As part of the Conference, Dr John Clayburn will be giving an invited talk focusing on Greenland on Thursday 17th September and the UK Polar Network have been busy organising events during and after the conference – details of these events will be published shortly. Further information about the conference can be found at http://www.arctic.ac.uk/research/uk-arctic-science-conference-2015/ including links to accommodation and travel options. Please contact Prof Grant Bigg (Conference Organiser) or Nicola Munro (Conference Administrator) if you have any questions or go to the Conference webpages for further information. The COMNAP “Antarctic Roadmap Challenges” (ARC) Project – Survey 2 is now open! Over 500 people accessed ARC Survey 1 and the results are now the basis of a second survey. Take the ARC Survey 2…it should only take 5 minutes of your time. Even if you did not participate in ARC Survey 1…now, is your chance to provide your input into the ARC project. WE NEED YOUR INPUT…please! In 2014, the first SCAR Antarctic and Southern Ocean Science Horizon Scan assembled Antarctic scientists, policy makers, leaders, and visionaries to identify the most important research questions that will likely be addressed by research in and from the Antarctic over the next two decades. The result was the publication of a list of 80 of the most important Antarctic research questions identified by the community. The list was published in Antarctic Science (Kennicutt et al, 2014) as “A roadmap for Antarctic and Southern Ocean science for the next two decades and beyond”. Many of the national Antarctic programs are now developing their own strategies on how they will deliver their science programmes in the future. Delivery of such a “roadmap” is not without its challenges. Using the SCAR Horizon Scan roadmap as an indication of future Antarctic science, a review of the 80 questions proposed reveals a number of challenges for national Antarctic programs of a practical and technical nature. The COMNAP ARC Project will focus on three of the challenges identified: Technology, access and extraordinary logistics requirements. HOW YOU CAN PROVIDE YOUR INPUT…is by way of the community surveys. The first survey is now closed with over 500 responses. It focused on understanding critical technology challenges. The results of Survey 1 feed into the questions in Survey 2 which look at funding, logistics, access and international cooperation challenges. Enter your responses by the deadline of 31 July 2015. The UK National Committee for Antarctic Research (UKNCAR) would like to invite expressions of interest from members of the UK polar community to join the committee. The UKNCAR promotes and co-ordinates the UK’s interest in the activities of the Scientific Committee on Antarctic Research (SCAR) and other areas of international Antarctic scientific activity. It is a committee under the auspices of the Royal Society, the national body representing the UK’s interests to the International Council for Science (ICSU). See http://www.antarctica.ac.uk/UKNCAR/ for more information about UKNCAR activity. The UKNCAR is a multidisciplinary committee with members representing UK scientific interests in Antarctica. Committee members are responsible for consulting with their disciplinary colleagues active in Antarctic research, to ensure that the Committee is informed by community science activities, concerns and potential future developments. Members include the UK Office Holders of SCAR, representatives appointed to the SCAR Standing Scientific Groups (SSGs), and the UK Delegate and Alternative Delegate to SCAR. The current Chair is Professor David Hopkins. Other members are co-opted from the UK Community to represent scientific interests not already adequately represented by the aforementioned members. The term of office is 3 years (April to April) with the possibility of one further consecutive term of office. UKNCAR meets once a year at the British Antarctic Survey in Cambridge. Travel expenses cannot be covered by UKNCAR, so attendees are required to pay their own costs for attendance. We are seeking to fill three places on the committee, starting in April 2016. Members will be selected by the UKNCAR. We aim for the committee to include expertise in as many areas of polar science as possible, from a good cross-section of UK science institutions. We expect to make a further call for members each year. Unsuccessful nominations from each year are encouraged to apply again. Experience of SCAR working groups would be helpful, and we welcome applications from those enthusiastic about fostering polar science within the UK community. The discipline member on the UKNCAR committee would be expected to represent the UK at biennial international SCAR business meetings (very limited travel expenses are available). If you are interested, please send an email to jennifer.jackson@bas.ac.uk<mailto:jennifer.jackson@bas.ac.uk> explaining briefly why you are interested in joining the UKNCAR committee, including a short (<1 page) CV and what area(s) of expertise you could offer. Deadline of Monday 29th June 2015. If you are not sure whether this is for you, informal enquiries may be made to David Hopkins at david.hopkins@rau.ac.uk<mailto:david.hopkins@rau.ac.uk>. NERC is joining Chilean funding agency CONICYT’s international co-operation programme, committing £1·8m in a ground breaking call working with Chile on a bi-lateral basis between funding agencies for the first time. The focus of the Chile-UK partnership will be on improving our understanding of the impacts of environmental change on terrestrial and marine ecosystems from southern Chile to the Antarctic Peninsula. Proposals will be expected to study multiple sites within the region. As part of FixO3 activities, ‘Transnational Access (TNA)’ is about supporting external users with coordinated access and full logistics support at no cost to the user for 14 open-ocean observatories and 1 shallow water test site, available to successful applicants. To illustrate the opportunity and practicalities, you are invited to visit the results of the 1st TNA call on the FixO3 website where selected proposal abstracts are also available. Observatory locations range from the polar regions of the Antarctic and Arctic, to the Atlantic Ocean and Mediterranean Sea with a choice of seafloor, mid-water and surface infrastructures with varying scientific focus due to each location’s characteristics. These observatories were selected as they offer the broadest scientific and technological capabilities for multidisciplinary observations such as atmosphere-ocean interactions at the sea surface and processes in the water column and seafloor. Gliders are also available for some of the sites. The observatories address a wide range of disciplines such as biology, biogeochemistry, chemistry, physics and geology. Reminder: Call for abstracts for the 2015 UK Arctic Science Conference is now open! Please see http://www.arctic.ac.uk/research/uk-arctic-science-conference-2015/ for further information. The Arctic in Rapid Transition (ART) network developed seven priority sheets of future Arctic marine and coastal research from an international early and mid career scientists’ perspective. They are now ready for download from the ART (http://www.iarc.uaf.edu/art/background/publications/art-priority-sheets) and ISTAS (http://istas.sciencesconf.org/resource/page/id/11) websites. The seven ART priority sheets comprise perspectives on ‘Arctic Biodiversity’, ‘Arctic Oceanography’, ‘Physical Processes in Sea Ice, ‘Arctic Land-Ocean Interactions, ‘Paleoceanographic Time Series from the Arctic, ‘Proxy Calibration and Verification’, and ‘Law in the Arctic’. The seven ART priority sheets are the product of the second international science workshop ISTAS (Integrating spatial and temporal scales in the changing Arctic System: towards future research priorities, http://istas.sciencesconf.org/) that was jointly organized in October 2014 by the Arctic in Rapid Transition (ART) network, the Association of Polar Early Career Scientists (APECS and APECS France), and the European Institute for Marine Studies (IUEM, Brest, France). During this workshop, future Arctic research priorities were discussed with regard to the natural variability of the Arctic marine and coastal systems over various spatial and temporal scales. One of the main priorities for future Arctic research includes the need to further interdisciplinary studies of the Arctic marine system in order to improve the knowledge on the modern and past Arctic Ocean’s physical dynamics, biogeochemical cycles and ecosystems, and thus to help predicting future scenarios in the high northern latitudes. The priority sheets are one of the ART network’s contributions to the ICARP III conference in Toyama, Japan in April 2015, fostering an improved understanding of the presently changing Arctic system as a whole in future Arctic research. The Natural Environment Research Council (NERC), the Arts & Humanities Research Council (AHRC) and the Economic & Social Research Council (ESRC), are planning a major new investment as part of the Valuing Nature Programme. • Health improvements associated with urban ecosystems. We would like to announce that the call for abstracts for the 2015 UK Arctic Science Conference is now open! Please see http://www.arctic.ac.uk/research/uk-arctic-science-conference-2015/ for further information. Professor Grete Hovelsrud of the Nordland Research Institute will give an invited talk on the Arctic change impact theme. Details to follow. The Southern Ocean Observing System (SOOS) is holding two open international workshops alongside the annual Scientific Steering Committee and Data Management meetings, all to be hosted by the Institute for Marine and Antarctic Studies, University of Tasmania (IMAS-UTas), Hobart, Australia. Numbers are limited so please register your participation at http://www.conferencedesign.com.au/soos2015/ as soon as possible. HOW YOU CAN PROVIDE YOUR INPUT…is by way of two community surveys. The first survey is ready for your input. It is focused on understanding critical technology challenges. We invite wide input from a range of disciplines (science and non-science) and backgrounds. Enter your responses by the deadline of 15 April 2015. A second survey will be launched in May 2015 which will focus on the remaining challenges. You can participate in both surveys, or only one, but please participate. NERC invites applications to join a scoping group that will develop the science case for a potential strategic research programme on ‘The Changing Arctic Ocean – Implications for marine biology and biogeochemistry’. Please visit http://www.nerc.ac.uk/research/funded/news/ao-ocean/ for further information. Deadline for applications is 30th March 2015. The Royal Meteorological Society (RmetS) student conference committee would like to welcome you to this year’s conference. The event takes place from the 1-3rd July 2015 at the University of Birmingham. This annual conference provides an excellent opportunity for PhD and Masters students to present their research in a relaxed atmosphere. The theme of the conference is weather and climate, and we are taking abstracts from numerous research fields including; cloud and microphysics, oceanography, paleoclimate, polar interactions and where art meets meteorology. The theme is broad, and covers many areas- so please send abstracts, even if you are not sure which session is best. There will be guest speakers, oral and poster presentations, and ice-breaker activities and meals. This year there will also be a photography competition! For more information please visit the website: http://www.rmets.org/events/student-conference-2015 and see the attached poster. Abstract submission closes April 13th, and registration closes 25th May. Four Canadian and U.S. partners in INTERACT open a call for transnational access for European-based research groups to conduct research at two Canadian and two Alaskan field stations: The CEN Whapmagoostui-Kuujjuarapik and Kluane Lake Reseach Station in Canada, and The University of Alaska Fairbanks Toolik Field Station and the Barrow Environmental Observatory in Alaska, U.S. The access to the Canadian sites is supported by CEN and AINA, and the access to the Alaskan sites is supported by the U.S. National Science Foundation (NSF). The support includes access to station facilities and support for travel and freight costs. The research should be conducted in 2015; the stations are open year around. Research groups where the group leader and majority of the group members are from a EU Member State or Associated State are eligible to apply for access in this call. E-mail your research proposal (see attached instructions, pdf) and CV by March 31st, 2015, to INTERACT Transnational Access coordinator Hannele Savela, hannele.savela(at)oulu.fi. The evaluation of the proposals will be conducted by the INTERACT Transnational Access Board in consultation with the field stations. The evaluation will be based on scientific merit, feasibility and appropriateness. The applicants will be notified about the grant decisions by May 15th, 2015. The Natural Environment Research Council (NERC) is inviting proposals to its International Opportunities Fund (IOF). The IOF scheme provides resources to NERC-supported researchers to allow them to forge long-term partnerships with overseas scientists that add value to current NERC-funded science. IOF grants are pump-priming, to help stimulate novel research collaborations. Mature research collaborations should apply to NERC’s Standard or Large Grant schemes, which allow for overseas project partnerships, or to other appropriate sources of funding. The WWRP/WCRP/Bolin Centre Polar Prediction School that will be held at the Abisko Field Station in Arctic Sweden from 5-15 April 2016 sponsored by WWRP, WCRP, and the Bolin Center. The school is part of the WWRP Polar Prediction Project and the WCRP Polar Climate Predictability Initiative. The launch of NERC’s new Strategic Research Impact Scheme is taking place on Tuesday 17th March 2015 in London. This event will provide academics and users of NERC science with information about the upcoming call for the Strategic Research Impact Scheme and facilitate the generation of ideas for collaborative projects. The Strategic Research Impact Scheme (SR-IS) is an exciting new scheme being launched specifically to accelerate impact from NERC’s strategic research programme investments. It will enable researchers and knowledge exchange professionals to access significant funding to generate high-profile impact from research and collaborate with partners on the design and delivery of large, coordinated projects. It will also enable stakeholders to work directly with the academic community to translate existing research to answer key business, policy, regulatory and other challenges and forge long-lasting connections with academic groups, NERC and other stakeholders. Attend this workshop to find out more about the scheme and the opportunities to engage with it. Places are limited so register soon to avoid disappointment. The House of Lords Select Committee on the Arctic has published its report ‘Responding to a Changing Arctic’. A news story about the report’s publication can be found here. The Antarctic Science International Bursaries are awards of up to £5000, made annually to support the development of the careers of promising young scientists, working in any field of Antarctic science. The purpose of the award is to broaden the scope of an existing research project, especially for postdoctoral studies, through funding extra field or laboratory work, purchasing/contributing towards the cost of a key piece of equipment or through funding international collaboration. Details on how to apply for a bursary can be found on the Antarctic Science website. Please note, the deadline for applications is 31st March 2015. The Scientific Committee on Antarctic Research (SCAR), the Council of Managers of National Antarctic Programmes (COMNAP) and the Commission for the Conservation of Antarctic Marine Living Resources (CCAMLR) are working together to attract talented early career researchers, scientists, engineers and other professionals to strengthen international capacity and cooperation in fields such as climate, biodiversity, conservation, humanities and astrophysics research. SCAR and COMNAP have again joined forces to launch fellowships for early career researchers. The SCAR and COMNAP fellowships are worth up to USD $15,000 each and up to six fellowships in total are on offer for 2015. The fellowships enable early career researchers to join a project team from another country, opening up new opportunities and often creating research partnerships that last many years and Antarctic research seasons. The deadline for SCAR and COMNAP applications is 3 June 2015. For more information on the SCAR and COMNAP Fellowships, visit the SCAR website at: http://www.scar.org/awards/fellowships/information.html or the COMNAP website at: www.comnap.aq/SitePages/fellowships.aspx. The SCAR and COMNAP opportunity is being launched in conjunction with CCAMLR’s Scientific Scholarship. The CCAMLR Scholarship provides funding of up to AUD $30,000 to assist early career scientists to participate in the work of the CCAMLR Scientific Committee and its working groups over a period of two years. The scholarship was established in 2010 and a maximum of three awards will be made in 2015. The objective is to build capacity within the CCAMLR scientific community to help generate and sustain the scientific expertise needed to support the work of CCAMLR in the long-term. The deadline for CCAMLR applications is 1 October 2015. NERC invites proposals for the first round of highlight topics, a new route for funding strategic research. Highlight topics focus strategic research on defined topic areas, and will be delivered through independent projects. NERC has allocated £12m to this call and a maximum of £3m (cost to NERC) is available per highlight topic. There are more highlight topics than funding is available for, so that all highlight topics will not, necessarily, result in funded grants. This is to ensure that only the very best research is funded. Notification of intent to submit a proposal must be received at least one month before the closing date. The UK Arctic Science Conference 2015 will be held on the 16th to 18th September 2015 and hosted the University of Sheffield. The Polar Predictability Workshop will be held from 8th to 10th April 2015 at the University of Reading. This workshop will discuss polar climate variability & predictability on seasonal to decadal timescales. Abstracts for talks or posters are encouraged for sessions on understanding causes of polar climate variability in observations and models, idealised predictability studies, operational polar forecasts and use of polar predictions by stakeholders. There will be a focus on sea ice, but contributions on other climate variables are welcomed. The prize-winner can be from any country and work in any field of Antarctic science or policy. The goal is to provide recognition of the important work being done by the individual and to call attention to the significance of understanding Antarctica in a time of change. A website with further details, including the process of nomination, closing date and criteria for selecting the Prize recipients is available at www.museprize.org. The Prize is awarded by the Tinker Foundation and administered by the Scientific Committee on Antarctic Research (SCAR). Closing date for nominations is 13th May 2015. L’Oréal UK & Ireland, the UK National Commission for UNESCO and the Irish National Commission for UNESCO, with the support of the Royal Society have partnered together to provide a dedicated UK & Ireland For Women in Science Fellowship programme for women scientists at post-doctoral level to enable and/or facilitate promising scientific research in the life and physical sciences. This year five Fellowships will be awarded to outstanding female postdoctoral scientists to assist them with their research. The Fellowships, each worth £15,000 (equivalent Euros for candidates in Ireland), are tenable at any UK or Irish university or research institute to support a 12-month period of research and for the first year we will be including maths, engineering and computer science. The Fellowship money can be spent in any number of innovative ways to enable women scientists to pursue their careers and facilitate world class research – such as buying equipment, paying for childcare or funding travel costs to an overseas conference. To mark its 50th anniversary in 2015, NERC will be supporting a series of events and activities to engage the public with its research. NERC’s Summer of Science will take place across the UK, enabling the public to encounter NERC research in a range of venues during the summer months of 2015. Funds are being made available to support, develop and deliver this. NERC is now inviting applications from researchers to deliver public engagement activities as part of the ‘NERC Summer of Science’ taking place during the summer of 2015. The deadline for applications is 17:00 on 26 January 2015. 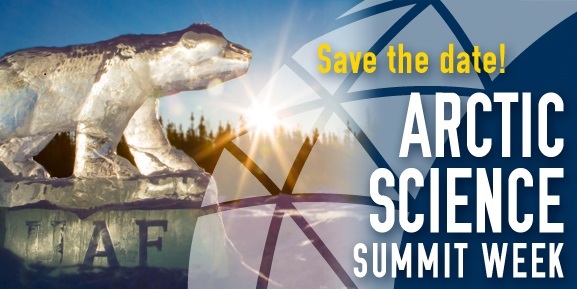 Save the date for Arctic Science Summit Week 2016 (ASSW) and the Arctic Observing Summit (AOS): 12-18 March 2016 in Fairbanks, Alaska, USA. The University of Alaska Fairbanks invites you to share your scientific accomplishments and join in the spirit of collaboration toward improving the coordination of Arctic research. Hundreds of scientists and policymakers from around the world will be in Fairbanks, Alaska, USA for the largest Arctic gathering of its kind in 2016. ASSW is an annual gathering of international scientists and policymakers who advance Arctic research. The conference promotes coordination, collaboration and cooperation in all fields of Arctic science. The Arctic Observing Summit (AOS) aims to build a common vision for sustained, long-term observations of the Arctic and serve as a forum for the planning and coordination of such measurements. The conference will include several workshops and side meetings, including the Arctic Council Senior Arctic Officials Meeting. Several ancillary events will also occur, including public lectures, field trips, and outreach and student events, including the Model Arctic Council. On 27 November, The UK Science Innovation Network, Russia, jointly with the Embassy’s Climate Section and the Consulate General in St Petersburg, held a roundtable meeting titled “Antarctic and Arctic in Focus of Science Research” at the St. Petersburg-based Arctic and Antarctic Research Institute (AARI). Three representatives of the UK polar and atmospheric sciences participated in this, along with leading Russian Arctic & Antarctic researchers from AARI, VNII Oceangeologia research institute, and Archangelsk-based North Arctic Federal University. The report is available here (pdf). The Natural Environment Research Council invites applications for its large grants. These support adventurous, large-scale and complex research projects tackling big science questions that cannot be addressed through other NERC funding opportunities. Research may address any area of science within the NERC remit, including strategic priorities and new curiosity-driven research challenges. Proposals may involve multidisciplinary approaches via inter- or intra-institutional collaboration, although this is not a requirement. Grants are worth between £1.2 million and £3.7m each, for a duration of up to five years. APECS, together with the Our Spaces – Foundation for the Good Governance of International Spaces, Polar Educators International, PolarTREC , the International Polar Foundation, Gateway Antarctica, the International Association of Antarctic Tour Operators (IAATO), eBIRD, the Sultan Mizan Antarctic Research Foundation and the British Antarctic Survey are once again proud to support Antarctica Day commemorations. This event was created to celebrate the spirit of international peace and scientific cooperation that signified the signing of the Antarctic Treaty in 1959. Antarctica Day 2014 is an international effort to disseminate knowledge about Antarctica and APECS is proud to help inspire a new generation of polar researchers. The day is for everyone, so take some time to celebrate with your co-workers, family and friends! Please see the Antarctica Day website for further information!